 somewere in the shadows of the light.  Big thing 4 ddr,and drawing but I love video games and Hanging with my friends. Wow im moving 2 korea! !that's like a long way away! !I sounded like a prep!!! *scary music plays*I miss my boyfriend!! !.-__-.i wanna c him so bad! !he i really kool and yall would just love him!nobody talks 2 me on her n-emore becuz i haven't been on in such a long time but im here and im bak!!! 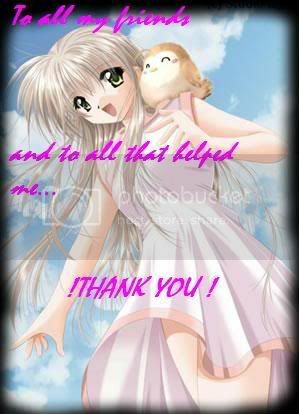 !plz plz plz talk 2 me.I wanna say thank u 2 kingdomheartsgirl and 2 inkenyo 2.0 4 helping me with my site so thank u 4 all ur help! hello!i just got done watching finding neverland and it wuz sooooooooooooooooooooooo kool!!! !i've always wanted 2 c it and i finaly did.I have 2 go 2 some sorta school thing 4 the rest of this month!!!NOOOOOOOOOOOOOOOOOOOOO!! !